The Wind Atlas of Finland service at www.tuuliatlas.fi has been well received by the Finnish public. The data material, published in Finnish at the end of November 2009, and the Wind Atlas map interface are now also available in English and Swedish. 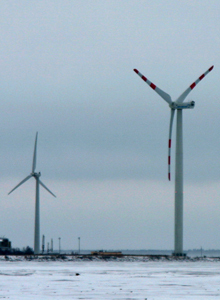 After the initial rush in November 2009, the Finnish-language Wind Atlas service has attracted a few thousand users per month, several hundred per day. - The Wind Atlas of Finland has also aroused international interest. After its publication, there has been debate about the possibility of producing a wind atlas for the whole of Europe using the same method, says Development Manager Bengt Tammelin from the Finnish Meteorological Institute. - Equally accurate web-based maps showing the results of modelling wind conditions has not been published anywhere else. The Wind Atlas is based on a model of a sample representing the last 20 years of wind conditions in Finland. For the model, 72 months were selected from the years 1989-2007, from which modelling runs were carried out. The results are presented as annual and monthly averages calculated at three-hourly intervals from the modelled wind data covering the whole country at a resolution of 2.5km x 2.5km. English and Swedish language versions of the website have now been published at www.windatlas.fi and www.vindatlas.fi. The Wind Atlas map interface user manuals and texts have also been published in English and Swedish. The map nomenclature in the Swedish map interface is in Swedish. At the same time, the cartographic content of the interface has been increased and additions made to the data page. More detailed information of the wind conditions on the coast and selected inland areas is now available. The results of the modelling at a resolution of 250m x 250m have been added to the service. The Wind Atlas work was carried out by the Finnish Meteorological Institute and funded by the Ministry of Employment and the Economy. The work was coordinated by Motiva Oy. Press releases are also available as RSS feed. Subscribe press releases to your email.